Animals, especially camelids, as well as people have a difficult existence in Tandil Argentina, because the climate is one of serious extremes, and the altitude is a problem. Under these conditions, full supply for animals is very tough. 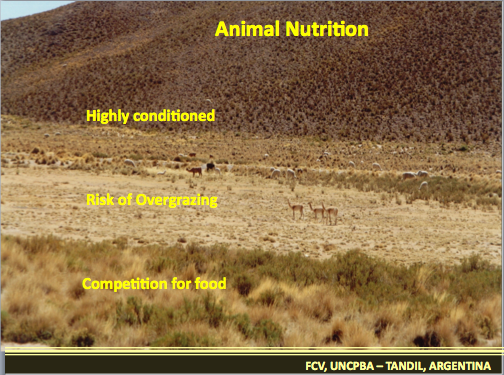 Their food supply is very dry grass, so animal nutrition is a problem. Highly conditioned by climate, animals run the risk of competition, overgrazing, and vicunas and donkeys continue to compete for food. History of the Puna is interesting because it is the only place where there are historical ruins of homes and a fort carved in stone. 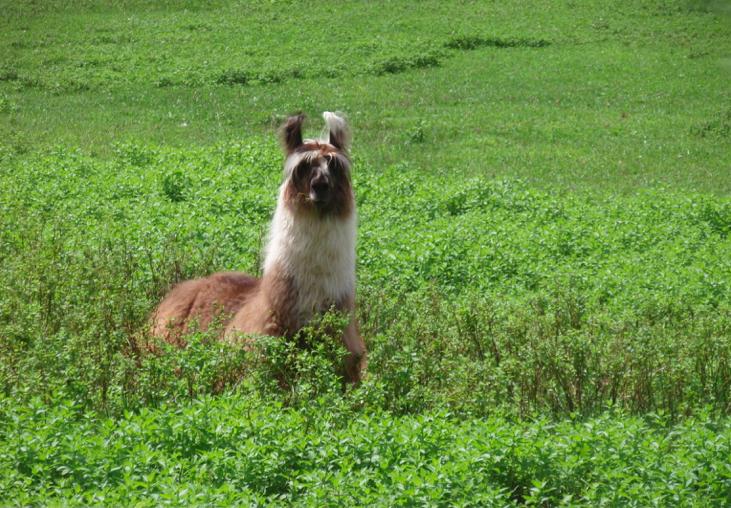 In the Puna, camelids, particularly llamas, are the prime source of food, as well as grains. For llamas to survive in this place is very difficult. 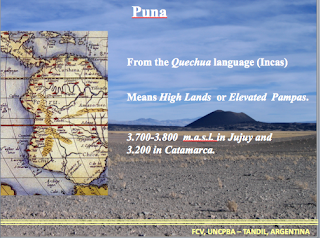 Colla or Coya are the people living there, and they were named by the Incas to mean people living in the Puna. Today over 30,000 people live there. Most people living in this area have 5 animals they call their own. 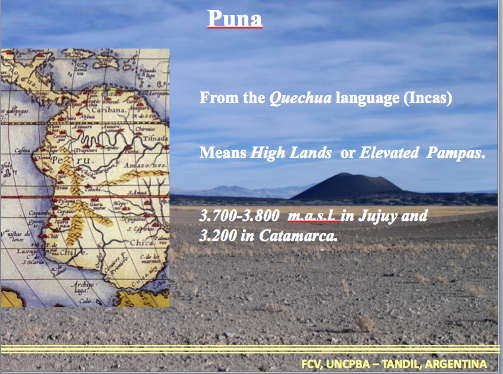 To find real Coya, you need to travel high into the mountains. Their traditions are very religious; there are churches everywhere. 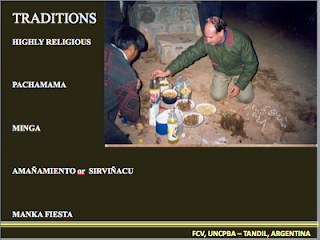 Pachamama is highly religious, and requires that you give everything that you receive back to Mother Earth. All belongs to God; whatever they have they do not see as a source of money. Animals exist to provide for their existence, so they take care of them. Minga is the tradition of cooperation and working together; they do not pay taxes. 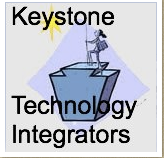 It is a way of thinking to work collectively. They bring all their animals together in villages working together for the community. Young couples do not get married immediately; they live together to "try and see." If it works, they marry. Their social situation is difficult; they have almost nothing. Today, a few roads; television is coming. When they see the outside world, they will want more. But the people will never get out of the Puna. It is their reality. And it is a very harsh reality, something we really cannot imagine in our privileged lives as hobby or business camelid farmers. Poverty abounds for people and animals. There are no doctors for these Puna farmers; a broken leg could take a week to mend. It could take hours or days to find a neighbor. People live crudely and having their animals makes the difference between having something to eat--or not. The people's economy falls to the women to maintain what they eat but the man's work is to go out and find work. People, especially women, look OLD at 25. There are no fences for the animals, so they roam at night and women must go out and find them to bring them back. Vicunas are increasing, even faster than llamas. 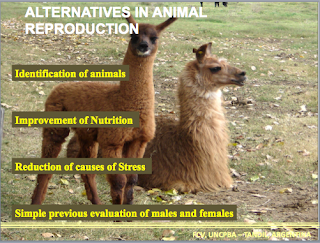 Vicunas are becoming a business, but for the rich, not the poor farmers. That is why Dr. Aba and his people have engaged in helping the people of the Puna. Animals and their farmer owners need to walk 2 days out and 2 days back to get veterinary treatment. That is why Dr. Aba and his people visit the villages in the Puna to help the people and their animals. He says that their working--and sleeping--conditions are hard. Difficult. But his photos show the rigor of their helping. Sometimes they used dry rivers to travel. Transportation to villages is a transportation risk. They even had accidents in their journeys. Dr. Aba noted that this society is male dominated. You have to work with the men to get them to allow the women to engage in the help, in the new technology, the new drugs. Aba's goal is to teach them how to treat their animals with the drugs and instruments. The people have to work hard to pay back to continue having the drugs and services available to them. The goal is to make them self-sustaining and confident of trusting his people in a very closed society. Closed for centuries. 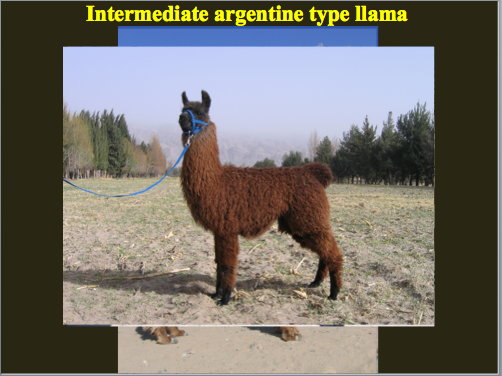 In defining the Argentine type llama, Dr. Aba cites that supplementation is almost impossible in the mountains. Moving the animals to the valley is a possible solution, but it takes 2 days to make the move, the job of the women. Today the people of the Puna have fences to keep the animals out so they can grow grass for the difficult times. Dr. Aba is also working on trying to get the people of the Puna to reduce the size of their herds. 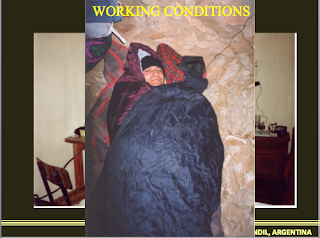 It is considered manly to have MANY animals, despite their conditions. Today, reducing the herd size is a difficult concept to teach because the men believe their neighbors will think them weak, based on herd numbers. Internal parasites exist but are not frequent because of the dry climate, but external parasites abound. It is difficult to teach the Coya how to treat the parasites. Getting them to return with their animals for treatment is difficult, but beginning to work. It is very hard to change centuries of a mindset, and that is the reality. Education makes a small difference, but even with government money it is hard to make them understand the importance of injectable drugs. Water is also an issue--just finding it. And getting them to understand where they and animals drink, and the placement of immersion baths. Finally, the best treatment is to get everyone treating their animals because the animals mix so frequently. What does the future hold? Only time will tell. Small steps work. For Dr. Aba's complete resoures, please check below.